Recently renamed the Zambezi region, this area is a complete contrast to the desert regions of Namibia with permanent waters. It borders four countries ”“ Angola, Botswana, Zambia and Zimbabwe. This is a region of gentle rolling hills, bushland and striking mountains that form the divide between the temperate interior and the coastal desert regions of Namibia. This region is one of the most scenic in Namibia with imposing granite mountains, dry riverbeds and sweeping savanna that goes on for miles, add in desert elephants and black rhino to complete the scene. This National Park offers excellent game viewing opportunities. Whilst the landscape may seem barren and unable to support any form of life, it is home to a vast array of wildlife. The waterholes are always a hive of activity. This impressive canyon is the second largest in the world and the largest in Africa. The landscape is magnificent and truly breath taking. Previously known as the Kaokoveld, is probably the most rustic and remote area of this vast country. It’s hard to believe that this harsh, arid environment can support both people and a thriving wildlife population. Colourful buildings, a ghost towns and wild horses of the Namib desert - seemingly in the middle of nowhere, little has changed here in the last 100 years. A coastline shrouded in mist and littered with shipwrecks and bleached whalebones. 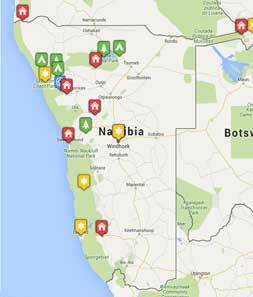 This seemingly, hostile yet beautiful coastline stretches from Kunene down to Swakopmund. Arguably the main attraction in the Namib Naukluft National Park is the towering orange dunes of the Sossusvlei, possibly some of the highest dunes in the world. Known as the adrenalin capital of Namibia with adventure sports aplenty, along with plenty of good restaurants and bars, Swakopmund is a pleasant stop-off on any holiday in Namibia. Slap bang in the middle of Namibia lies Windhoek, you would be hard pushed to find a more organised, modern city in Africa. It has a unique blend of African and European cultures while still keeping a distinct African vibe.